The iteniary for the next three weeks is to visit as many offshore and inshore islands as possible in Melville Bay, looking for new bird colonies and to monitor known ones weather and ice permitting. 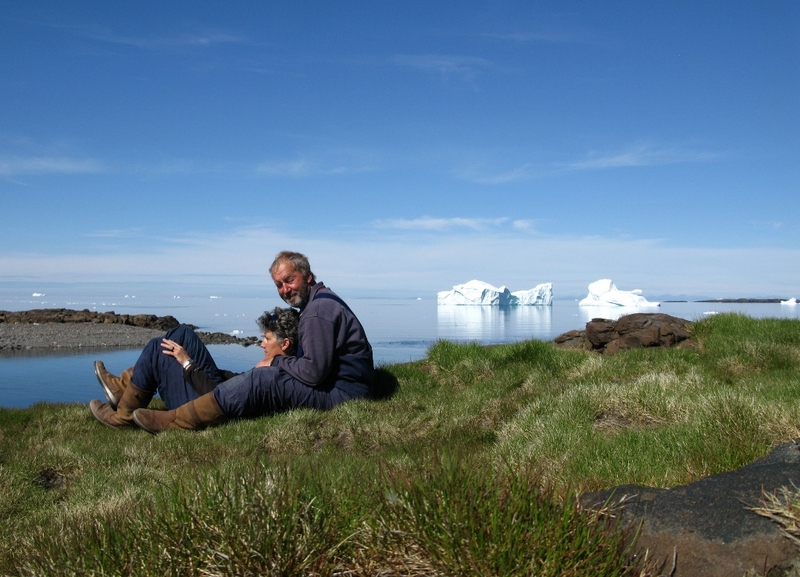 Melville Bay from Kudlorssuaq to Savissivik is 200 miles of uninhabited islands and glaciers meeting the sea, Polar bears and Narwals are possible sights. A large area of Melville Bay is two Wildlife reserves; you have to obtain a permit to enter and have a reason for doing so. Permission was obtained some months before, so we were clear to enter and explore. Cartography is vague to non-existent, navigating here is called white charting for obvious reasons. We found rocks that are Islands and didn’t find two Islands that were charted, eyes glued to echo sounder are de rigour! 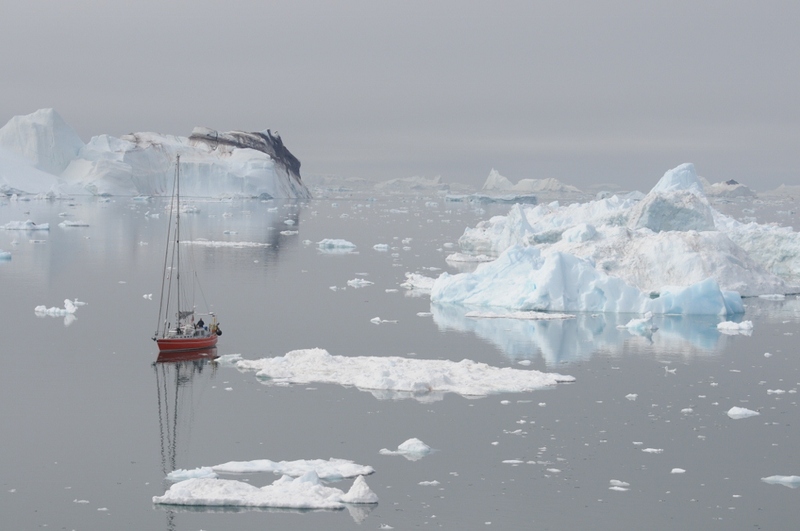 The whole time looking over our shoulder at the weather in this very open bay, each evening seeking out shelter for the night, anchor/ice watch become a regular occurrence, fending off small bergs and tying our lines ashore high so the small bergy bits can slip by. The further North we went the more the weather turned against us making our goal to reach Savissivik unlikely if we were to return to Upernavik in time for Davids and Nicks flights. After three days anchored in Fisher Oer a slow moving low started to move out giving us two days clear of SE gales we decided to head south, visiting some of the outlining islands we had missed on the way up the coast and get back to Upernavik before the next south easterly arrived. Overall, we returned early to Upernavik having visited a large part of the area we had set out to visit, some new colonies found and logged. Pods of Narwals seen swimming off the headland of Nugssuaq. And sounds surveys completed in Melville Bay as part of a study to study the effects of the seismic surveying that are currently taking place. A very enjoyable charter in the wild Arctic wilderness, thanks to David and Nick for making our jobs very pleasant and easy. Meeting Rev Bob Shepton (S/Y Dodo’s Delight), rounding up a couple of his stray climbers, spending time in Laksefjorden and enjoying the sea trout from it. The usual repairs/ maintainance to keep us on top of things, also to finish off a couple of jobs we had put on hold we got to Greenland! We returned to Upernavik ready for our next charter, passing S/Y Billy Budd (another yacht we know from Patagonia) rounding into the harbour anchoring with 2 lines ashore we were soon one of five yachts. 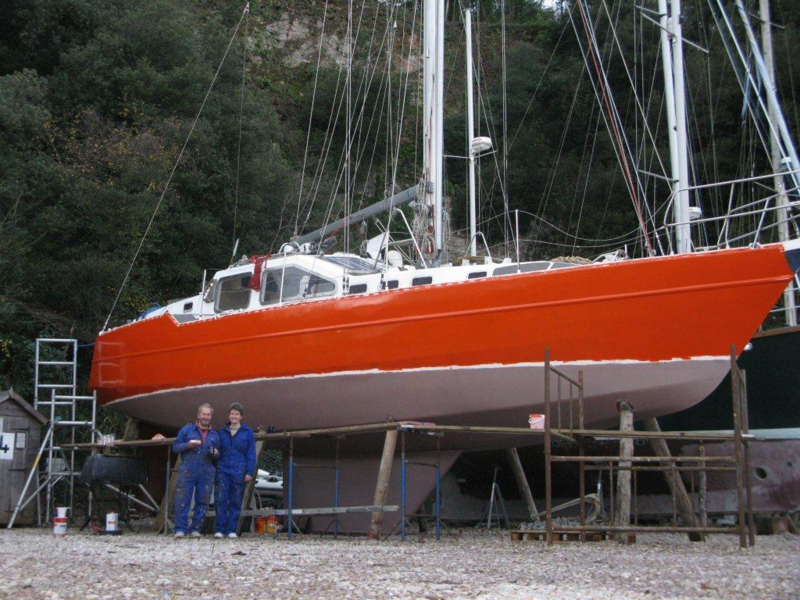 S/Y Vagabound2, a French couple with two small children that have just spent the winter in Grisefjord. 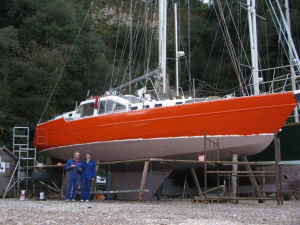 S/Y Dodo’s Delight leaving soon for North West Passage S/Y Jonathan also for NWP, S/Y Bulzebub also for NWP. Greenland is becoming a busy place. A low passed over giving us probably our worst weather since arriving in Greenland. 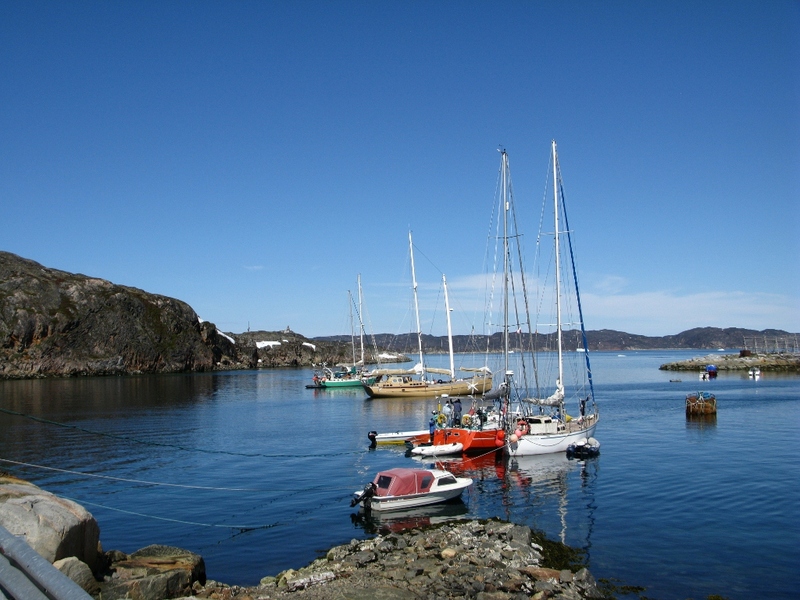 Upernavik is not a very well sheltered harbour with the occasional Iceberg entering. Once the weather passed we were left all alone waiting for our next charter guests to arrive. 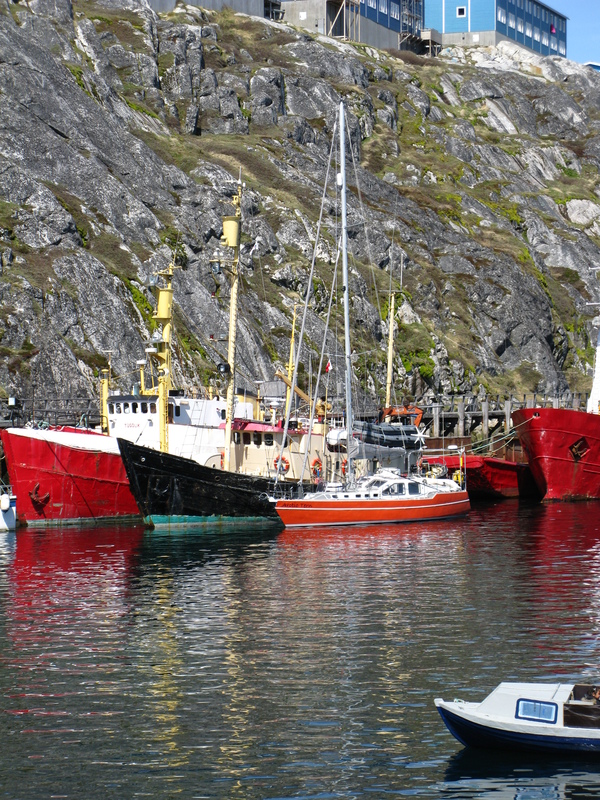 21st June, Greenland’s National Day, our charter guests arrived. A multi-national team via the Greenland Institute of Natural Resources (www.natur.gl) Three weeks of studying local sea birds including guillimots, gulls and kittiwakes but their main interest was the Eider Duck. In summary, this charter we enjoyed very much, three weeks excellent weather only a couple of wet days. Visiting many islands offshore and inshore and in the fjords from Ilulissat to Kaulshavn spotting, counting, measuring eggs, nests and birds and meeting some local hunter/ wardens. We sampled local food (whale), catching Caplin similar to sardine and drying the excess for later tasty snacks. The charterers were a great group, Flemming, Peter, Nick and Kitta were a pleasure to have onboard. 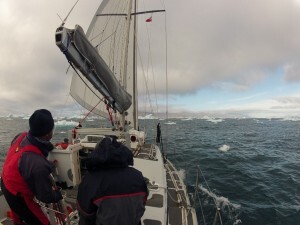 We left Nuuk with light southerly winds forecast which filled in nicely, ending in a belting sail direct to Aassiat. Arriving to find Tooluka, La Louise, Gambo and another French yacht all anchored in the harbour. Eef called us to moor alongside Tooluka a great reunion after two years. Busy harbour, they say only 20 foreign visiting yachts a year. 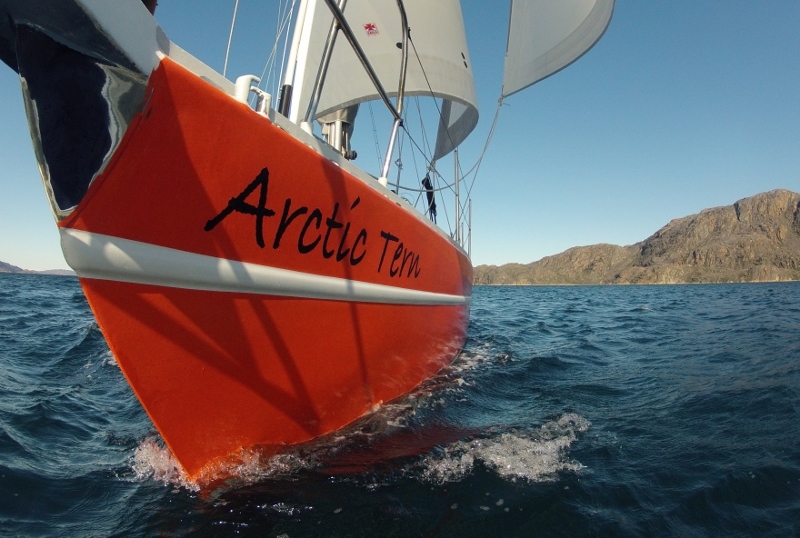 In Aasiaat we enjoyed the cruising lifestyle sharing drinks and meals with friends old and new, felt like a well-deserved after all the hard work of preparing Arctic Tern UK. A couple of days passed quickly. Buying last provisions topping up with fuel, we left Aaissat via a local anchorage to fill up with water from a stream a place the locals go to fill cans for preferred drinking water. Onto a nature reserve for Arctic Terns nesting site a very peaceful anchorage for the night. 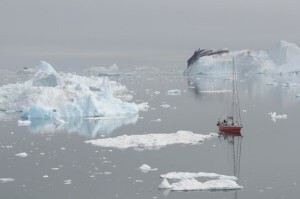 The next day we crossed Disko Bay towards Ilulissat, an intimidating entrance of about six miles through the ice floes from Jacobhavn Isfjord . One of the northern hemispheres most productive glaciers of icebergs. The tiring five hour journey weaving our way through some very large icebergs to parting a carpet of large ice cubes. We arrived at the busy fishing harbour Ilulissat just as a gale warning was issued. Finding a place to tie up was decided for us as Abel Tasman was tied alongside a large long liner. Finally secure the mist and the mosquito’s descended. Ilulissat a town set up for tourists, with bars hotels restaurant’s and internet cafes not forgetting the magnificent Jacobsfjord Ice fjord which provided us with an interesting entry, tourists can walk alongside it with fantastic views right across it. 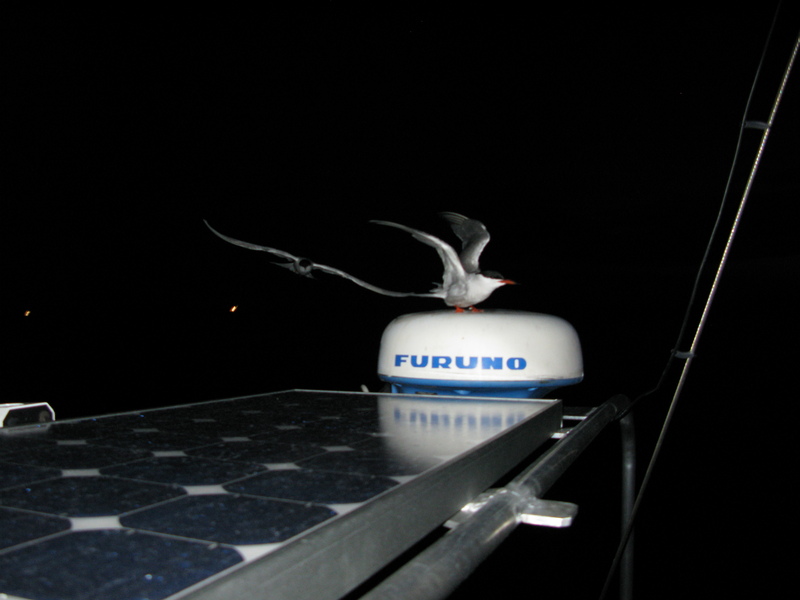 We left North Wales on the 15th May and after a brief stop in the Isle of Man to pick up a new wind and solar panel regulator, we departed the Irish sea via the North Channel. Despite a rudder problem, progress was good with between 85 and 168 miles per day, winds in comparison to our last Atlantic crossing to Greenland were relatively tame. Nick managed to get plenty of sights and complete his RYA Yachtmaster Ocean Theory on the way. 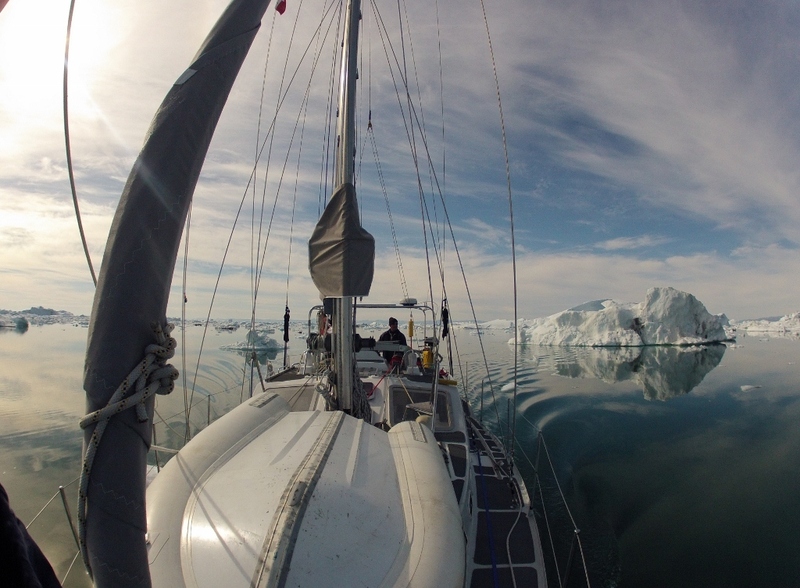 We stayed further out from Cape Farewell this year and didn’t see Icebergs until we closed the coast for the inter-island south entrance into Nuuk, a delightful end to a 16 day passage with 24hour daylight. Tying up next to “La Louise” who we saw last year, but didn’t meet the owner Thierry Dubois until now, 1am local time Saturday. Nuuk, unlike the last three visits surprized us with exceptional weather and temperatures of 25 degrees, allowing us to enjoy a BBQ on the beach with our friend Jens, his family and neighbours sampling the local fare (seal). Next couple of days; finding our land legs, the usual repairs/ maintainance, loading with fuel and water and of course laundry, while Nick and Lou discovered Nuuk, before their flight home. 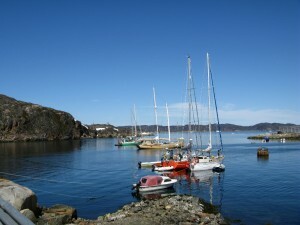 Calling all Sailors, Climbers, Mountaineers, Kayakers wanting to visit West Greenland Summer 2012. Currently ashore in Dartside Quay, Galmpton, Devon. 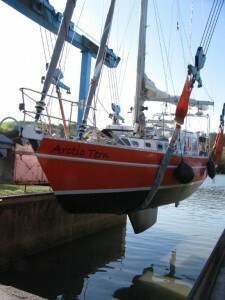 Major refit, preparing Arctic Tern for her next expedition.